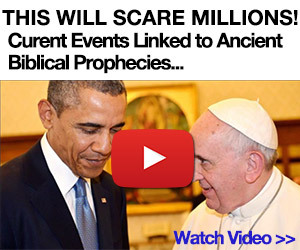 You are here: Home » Economic Collapse » Are These The 3 Most Sinister Secrets of the Catholic Church? The Catholic Church has had a long history of sinister secrets and violence. Most everyone knows about their major involvement in violent historical events like the Inquisition, Crusades, Excommunications for nefarious reasons and witch hunts based on superstitions. These 3 modern day cover-ups prove the Church has not changed much during the years and is far from being an example of morality they claim to be. Does it not seem odd to you that America, the greatest nation on Earth, the greatest evangelical nation, the richest and the most powerful country today in not even mentioned in the Bible or Bible prophecy? After all, some churches teach that the Bible accurately predicts many other historical events including the two world wars, man reaching outer space and the return of the Jews to their homeland after centuries of exile. Around two-thirds of the population of Rwanda is Catholic. Human rights groups and survivors’ groups claim the Catholic Church was complicit in allowing the genocide to occur, while some Catholic clergymen participated in the massacre themselves. In addition, the Catholic Church and its clergy have helped some of the perpetrators of the genocide flee Rwanda to escape persecution or shielded them from extradition. An organized network of Catholic priests helped and protected the genocidal priests. One such priest was Father Athanase Seromba. During the Rwandan genocide, Father Seromba told around 2,000 Tutsis that they could take refuge from the violence inside his church. On April 6, 1994, when 2,000 of the Tutsis gathered inside, Seromba ordered the Church to be bulldozed with the Tutsis inside. After the Church was flattened, Father Seromba and his henchmen shot the remaining survivors. According to biblical scholar Dr. Nathan Shepard the church was fully aware of these secrets many years ago but they chose to keep them under total secrecy. And there is a very good reason for that. You can watch his entire documentary here. I’d always thought the Croatian genocide had seemed so much like the Nazi techniques that ex-Nazis must surely have been involved. The U.S. didn’t want to try nearly enought Nazis for their war crimes against humanity after WWII.